The City of Sunny Isles Beach spring season of programs, classes and events is in full swing. Residents and visitors can choose from lectures, services, trips, concerts, special events and social gatherings when making their plans. Two of the City’s program partners have offerings this week. Mount Sinai Medical Center’s free monthly lecture will take place on Thursday, April 2 in the SIB Commission Chambers (18070 Collins Avenue). The topic is Metabolic Syndrome and the presentation runs from 10:00 am to noon with reservations required to 305.674.2600. 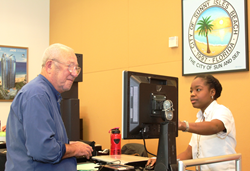 The following day, Friday, April 3 the monthly MiniFLOW: Florida Licensing on Wheels, provided by the State of Florida, will be held from 9:30 am – 2:30 pm in the First Floor Meeting Room of the SIB Government Center (18070 Collins Avenue). For questions visit GatherGoGet.com or call 850.617.2000. Two great cultural trips are planned for April. Sunday, April 12 baseball fans can let the City do the driving to Marlins Park to see the Miami Marlins play the Tampa Bay Rays. Tickets are $33 for Residents and $38 for Non-Residents. The bus leaves at noon and returns at approximately 5:00 pm. The next fun trip is planned for April 23, 9:30 am to 5:00 pm, to Seminole Casino in Coconut Creek. Spend the day gambling on Vegas-style slot machines and live table games. The price to get on the bus is $5 for Residents and $10 for Non-Residents. Stop by Pelican Community Park (18115 North Bay Road) or the Government Center (18070 Collins Avenue) to buy tickets for these trips. Twice monthly Bingo continues to go strong with dates set for April 1 and April 22. The cost is a mere $2 for the eight game bingo session. Consider signing the kids or yourself up for a monthly class like yoga, karate or gymnastics. Other programs such as fine art, chess, guitar and piano begin the April - May session soon. There is plenty to keep everyone engaged and active in Sunny Isles Beach. These are only a small portion of the offerings for this month. Check the Living magazine, sibfl.net or SIBTV Channel 77 for a complete listing of our programs and classes. For more information, call 305.792.1706.